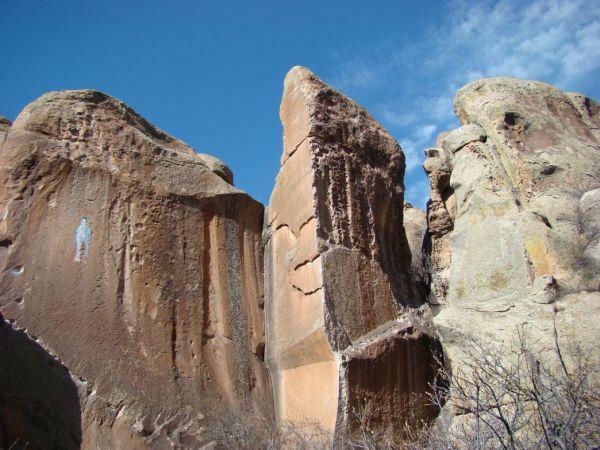 Set in the heart of the San Luis Valley in south-central Colorado, Penitente Canyon was once a refuge for the Penitente Brotherhood of Catholic monks, who lived and worked in relative seclusion near the Colorado/New Mexico border in the early 20th century. The canyon was named for this society, who painted a blue Madonna on one of the cliff walls by suspending tired from ropes and hanging in space to complete the project. You can still see the painting on the cliff known as Virgin Wall. Rock climbers began developing the area in 1985, and today, Penitente is known for its world-class sport climbing on bullet-hard rock. 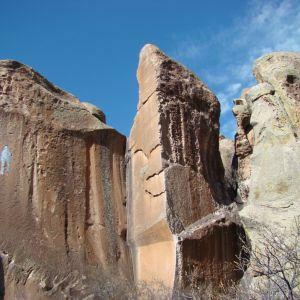 Penitente Canyon is primarily a sport-climbing destination. It boasts more than 300 bolted routes. There’s also some trad climbing to be had here, but bring plenty of tape—if you’re plugging your own gear, you’ll be following rough crack systems. Bouldering here is largely undeveloped, but with plenty of opportunities. The majority of climbing at Penitente—including its most classic routes—is graded 5.10 and above. There are several 5.8 and 5.9 routes, and a handful graded easier, but if you’re a 5.11 climber, a visit to Penitente will make you feel like a kid in a candy shop. Don’t be too intimidated by the grades, though. Climbs here are tough, often using tiny crimps and edges, but they’re bolted conservatively, so it’s a great crag for pushing your grade. (There are also plenty of climbs that use big jugs and huecos.) Most routes at Penitente are between 25 and 75 feet tall, tending toward the shorter end. Maximize your Penitente climbing experience by spending the whole week here. The canyon and its campground are managed by the Bureau of Land Management, so camping here is relatively cheap—just $11/night for a single site. The campground has nine walk-in sites, four drive-in sites, and a vault toilet. Though the best-known climbing at Penitente is tough, it’s worth making a trip if you’re a novice climber looking to top-rope some friends’ routes. It’s also an ideal climbing destination for climbers who have some confidence and skills and want to try their hand at leading somewhere that’s bolted safely. Prime time here is in May and October, when between San Luis Valley’s more extreme temperatures in the summer and winter months. You can climb here in the summer—it’s Colorado, after all—but keep in mind that highs are often in the 80s. There’s rarely more than a few days of precipitation here, even in the summer. The BLM also encourages climbers to stay in relatively small groups, use established trails (not social trails) to approach climb, and minimize chalk use, including brushing off heavily chalked holds. The climbing ethic at Penitente holds that climbers should use colored chalk to blend with the natural colors of the landscape. There’s no new bolting allowed in any public lands in the San Luis Valley.